We are very excited to take our first trip out of the Uk with My Friend Lester. December 1st 2016 we will be performing the original 1- act 2-person show at Ösbyskolan, near Gustavsberg in Värmdö, Stockholm, Sweden. Hope to see you there. My Friend Lester will be playing May 29th at the Kino Teatr in St Leonards. A BIG welcome to world class musicians John Donaldson on piano and Simon Thorpe on double bass, we are so happy to have you on board! Do not miss this one! Listen to Paul Levy’s interview with Maria McAteer about the new rendition of My Friend Lester on World Fringe Review. Brighton Beam Productions are very proud to announce that My Friend Lester will return to Brighton Fringe in 2015 at a new venue and with a live band. Check out the performance dates and get your tickets from the Performances tab above. 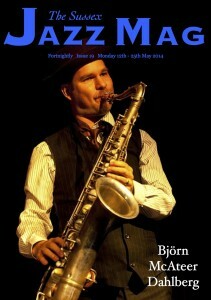 A cover, a big interview with Björn and a lovely mini review in the latest issue of the Sussex Jazz Mag. Get it here! Nigel Nevinson from Fringereview.co.uk gave us a nice review over at their site and gave us the recommeded show badge.